Travis received his Bachelor of Science in Geography from the University of Alabama and his Masters of Science in Marine Biology from Nova Southeastern University. 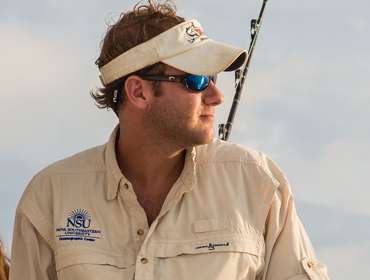 Travis has conducted fisheries science research with his masters advisor Dr. David Kerstetter at the NSU Oceanographic Center over the past 6 years. His research primarily focused on the trophic dynamics (foodweb) and feeding ecology of several recreationally important fish species found in the coastal pelagic to pelagic environment of the waters off southeast Florida. He has been involved with multiple research projects including: evaluating mercury (Hg) concentrations in tunas/mackerels, Deepwater Horizon oil spill effects on tunas and swordfish, and swordfish behavior and migration patterns in the central Caribbean around the Cayman Islands using satellite tags. He also conducted international research with Dr. Kerstetter, in collaboration with NMFS International Affairs, working on bycatch reduction technology in Turkey, along the eastern Mediterranean, as well as the western Atlantic in Morocco. Travis has over 20 years’ experience as a recreational fresh and saltwater angler.